The stories of the great women of the Bible are rarely read during Mass on Sundays. 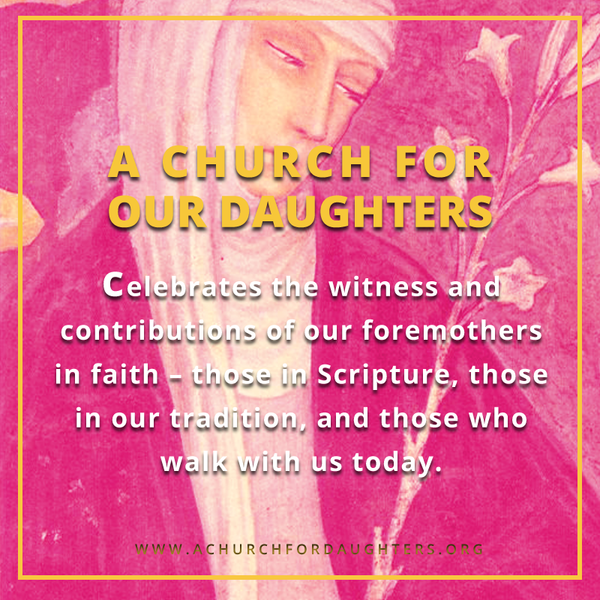 The lack of women’s stories in our readings at Mass leads many Catholics to assume that women did not play a role in our history, leaving our daughters with little opportunity to learn about, be inspired by, and pray with these great women of the Bible. The 2008 Synod on the Word Catholic bishops discussed the need to restore women’s stories to the Lectionary (Synod proposal 16). To date, there has been no follow up to this important proposal. A feasible next step would be to convene a gender-balanced group of biblical scholars and liturgists to decide which women’s stories would be most fruitful for prayer, preaching and catechesis. Scripture shows Mary of Magdala as the primary witness to the most central events of the Christian faith. Art by Margaret Beaudette. Used with Permission. Until recent centuries most historical texts —including the Old and New Testaments—were written by men. And so it’s not surprising that Lectionary readings are mainly about male biblical figures. When women’s stories are included, the selections and attendant preaching invariably reflect what men think about women rather than what women themselves thought or did in biblical times. Catholic women and men are edified to learn that Jesus included women in his Galilean discipleship and that women received the first commission to proclaim the Resurrection. Luke 8: 1-3 tells us that Mary of Magdala, Joanna, Susanna and many other women accompanied Jesus and ministered with him in Galilee. Yet this Lucan reading is rarely heard on Sunday, since it is optional on the 11th Sunday in Ordinary Time in Year C. Mary of Magdala’s commissioning to “go and tell my brothers” that Jesus has risen (Jn 20: 10-18) does not appear on Easter or on any Sunday of the Easter season in the U.S. but is relegated to Easter Tuesday. Many Catholics mistakenly believe that St. Paul was anti-woman. Unfortunately, Romans 16, a passage that names 10 women and identifies some of them as deacons, apostles and co-workers, is never proclaimed on a Sunday. Nor are the accounts of women leaders in the Acts of the Apostles (Lydia, Prisca, Tabitha), which are read only on the weekdays of Easter. As a result, most Catholics never hear about these important women who minister alongside Paul and Peter. Missing too are the stories of women from the Old Testament, such as Shiprah and Puah, who saved a nation of boy-children, perhaps even Moses, by defying Pharaoh’s law to kill all male infants born to the enslaved Hebrews. Currently the Lectionary version of Exodus 1:8-22 (Monday of the 15th Week in Ordinary Time, Year I) excises these valiant women by inexplicably omitting verses 15 to 21. Proclaiming Lectionary texts that exclude or distort women, particularly in a church where all priestly liturgical leadership is male, is dangerous for our daughters and our sons. Young girls can hardly avoid internalizing the notion that God must have created them less important than their brothers. If all-male liturgical leadership and Sunday Lectionary readings are subtly seeding subordination in our daughters, what is being planted in our sons?